This is a demo I did years ago for the datacentre I was working in then. We were working on an asset register system, and I was hoping to be able to generate these maps from that data. You should be able to do the same kind of thing with racktables or OpenDCIM. A column of ‘notch’ nodes. All but the first one are positioned relative to the one above. These are a simple gif image. The actual servers and equipment. Those are positioned relative to the notch nodes. 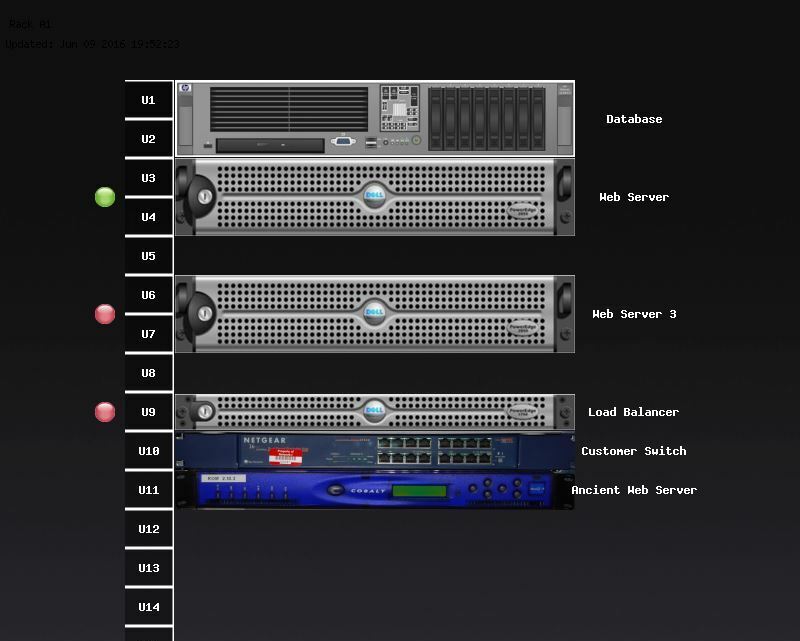 We used a combination of rack-diagram images from Visio, and actual photos taken square-on to the front of racks. Pick a size for 1U, and that will dictate what 19 inches across is. For us, it was 400 pixels. Use that as a scale on all your icons. The vertical will fall into place, but set the Y scale on your icons to something large, so that it will never be the ‘important’ scaling dimension. Status indicators. Those are positioned relative to the servers. The original version also had some nice fonts defined, but distributing fonts is much more complicated so I changed the downloadable example to use the built-in fonts. So first, we define a template node for how to draw a ‘notch’. This contains the icon, and the label, so they don’t need to be repeated. Then we define all the notches. You can generate this code in Excel or a scripting language very easily. Or just stick with my dimensions and use the template in the zip file. Next comes the server. For a 1U server, things are simple. We just use relative positioning from the appropriate U notch. For larger servers we need to do a little maths: the node is positioned from its centre, so we need to know that a 2U server is 19 pixels down from the first U position it occupies. Note that everything is positioned relatively. This means you can move the whole rack by moving one thing (the U1 notch). The status indicator will follow the server if you move it, too.